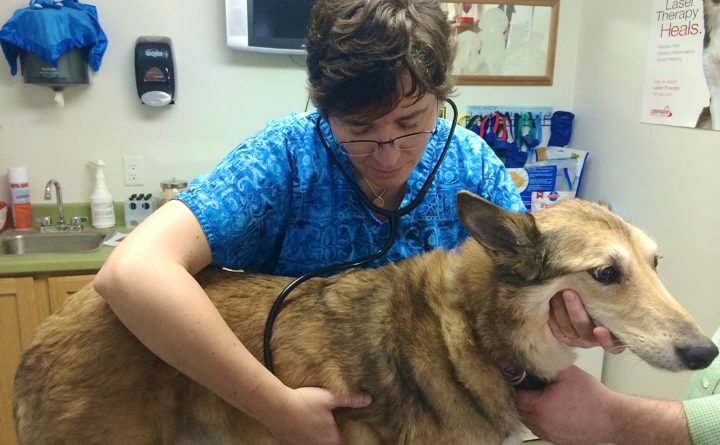 Dr. Christiana Yule examines a dog at the Fort Kent Animal Hospital in this Feb. 28, 2016, file photo. FORT KENT, Maine — The state Board of Veterinary Medicine and attorney general’s office fined and placed on probation for at least five years a local veterinarian accused of diverting drugs and improperly handling animals in her care. Dr. Christiana Yule, who owns and operates Fort Kent Animal Hospital, conceded in a consent agreement filed with the veterinary licensing board on Jan. 16 that on two occasions dating back to 2011 she “handled a canine patient in a rough manner” and that in March 2017 she left the facility while a cat was under anesthesia. While Yule does not admit to diverting diazepam or hydrocodone for her personal use, but acknowledges in the agreement that there “would be sufficient evidence for the board to find by a preponderance of the evidence” that she would be subject to discipline. A former employee filed a complaint against Yule in March 2017, prompting the investigation that led to the action, according to the document. Yule has agreed to accept a reprimand by the veterinary board, to pay a $3,000 civil penalty and to enter into a minimum five year probation period effective Jan. 16, 2019, the day she signed the agreement. Yule also must “develop and submit to the board a written plan describing in detail how she intends to practice veterinary medicine in the event that she no longer has a Drug Enforcement Administration (DEA) license” and must notify her clients immediately if that license is revoked. Yule was not immediately available for comment Friday. This story originally appeared on the Fiddlehead Focus.